I've been receiving the cutest cards in the mail from family and friends. I love them all. Homemade, store bought, self-designed, whatever. I really appreciate each card, and love seeing the photos and reading the letters. 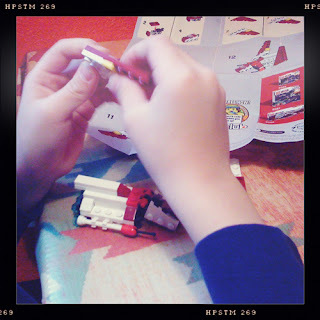 What's killing me is that I haven't put something together for us to send out. I don't even have a good photo. Sigh. 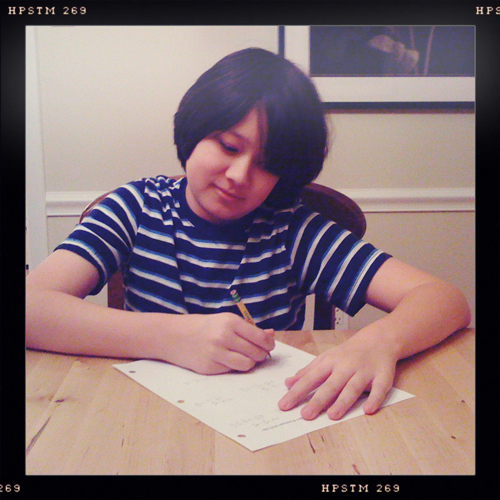 A few months ago, my friend Erica kindly asked me to guest at Two Peas in a holiday card challenge with her. I created this one, all digi. It's the year of the Rabbit. So I have a feeling it's going to be a good one. Hope you have a Very Merry Christmas and The Happiest New Year! Anyway, first, our winner of CK's two special issues. 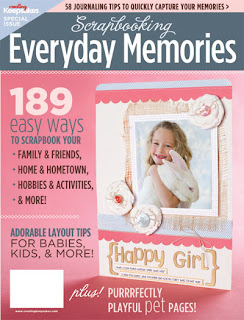 The every day issue looks really inspiring! Thanks for the chance! Arjanne, drop me an email using the button on the left sidebar. Congrats! I think you are going to love both issues. 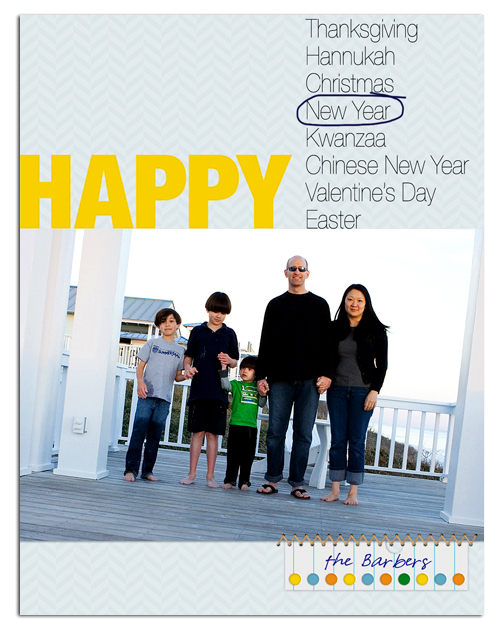 As seen in the January issue of Creating Keepsakes magazine. Copyright Creative Crafts Group. Posted with prior permission from the publisher. I was supposed to create a layout a la Stacy Cohen, and I don't think I accomplished it all too well. Stacy is one of a kind. Her layouts are amazing and intricate. If you don't know Stacy's work, you need to check it out. Alrighty. I'm off to clean up the house (for the millionth time this month), and go to the mall. How very suburban of me. I was looking back at the few posts I've written since I started this blog, and realized that I have a large number of giveaways, and a very small number of layouts shared. Not sure what that means. I should scrap more? And share? Hee hee. 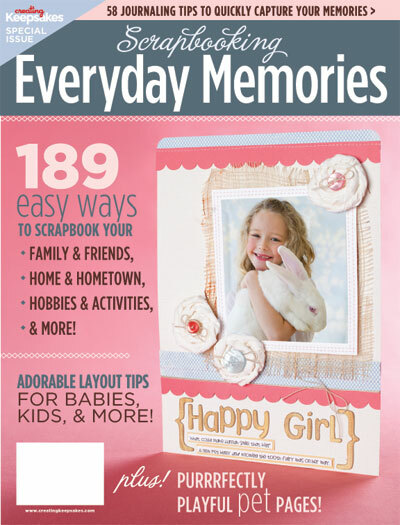 Creating Keepsakes is giving away two of their current special issues to one of you! I have read them both, and found them to be filled with great ideas, information galore, and just nice eye candy. Scrapbooking Everyday Memories. Love that sweet cover. You can get a sneak peek of this issue here. 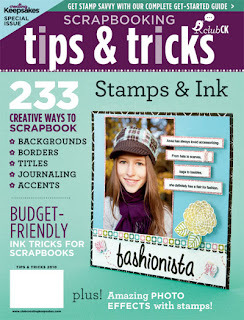 Scrapbooking Tips & Tricks: Stamps & Ink. I have so many stamps, but I'm not that good about using them. 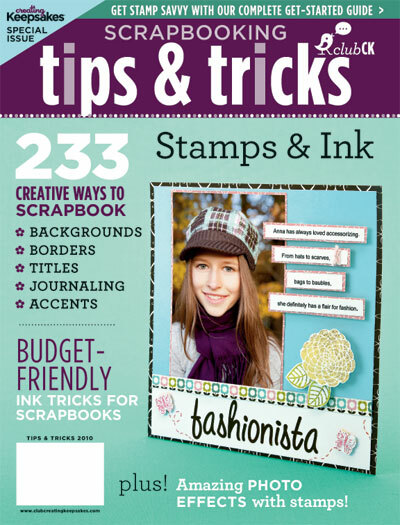 This issue will give you a ton of ideas of what to do with stamps, inks, etc. Take an inside peek here. Please leave me a comment, and I'll pick one lucky person this Saturday morning. Please do check back to see if you are one of the winners! Meanwhile, I have a discount code for you to treat yourself (or a friend) to a little something from the CK store: CKDT15 (this is good for 15% off all items in the store, expires 12/20/2010). Nothing like an early holiday gift to oneself. Trust me. I know this from experience. Good Morning! Thank you all for your sweet comments. It's interesting how many of us dislike stainless steel appliances! You'd think that manufacturers could come out with stainless steel that repels fingerprints by now. One can dream.. or buy white appliances and save lots of money! Onto the goody boxes! 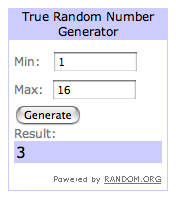 I used random.org and we have two winners! First of all, I agree with you wholeheartedly on the stainless steel appliances! What a great idea - pre-kids. ack! Best of wishes in your home selling, your changes will really help! Would love a box full of scrap goodies, what fun!!! Wow! I liked the red color on the walls, too. Thanks for the chance to win. Good luck on the house selling! 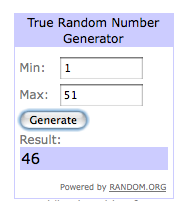 Winners, please email me using the button on the left column within the next week. I would like to send out your boxes before Christmas! And if you didn't win, don't despair. I'll have more boxes. 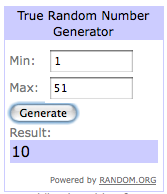 Meanwhile, I'll have another giveaway tomorrow. 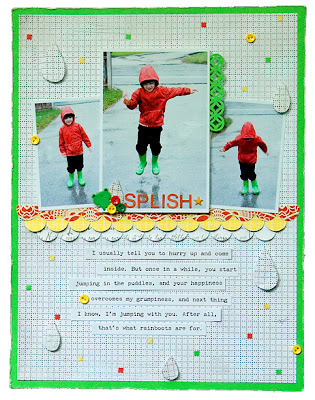 Two special Creating Keepsakes issues that I think you'll enjoy. A lot! We had our first showing on Saturday. And that person is interested. I'm not going to hold my breath, but woohoo! And then we had an Open House on Sunday. I had to come up with things to do outside of our house all weekend. The plans were worthy, but the weather was frigid. 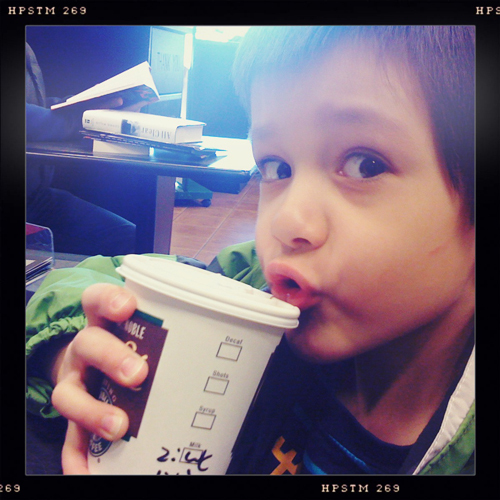 In the end, we ate/drank (indoors), looked at books (indoors), shopped (indoors). 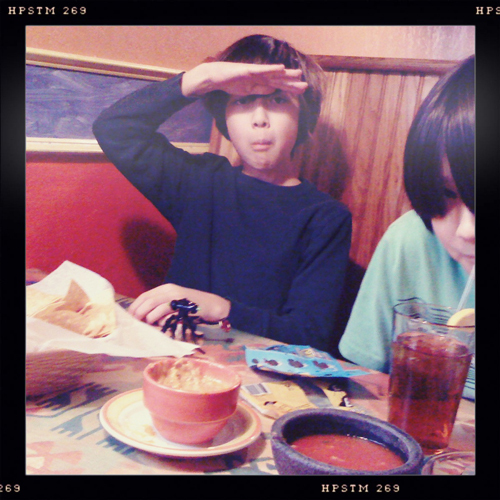 At our favorite Mexican restaurant. Good Mexican food is rare around here. Looking forward to lots of choices in LA. 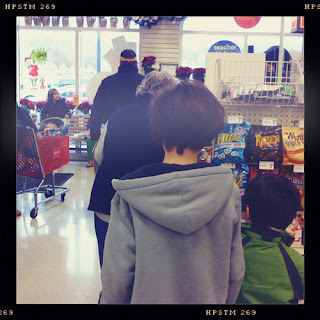 I'm not above bribing the kids with presents to buy myself some goodwill and love. Michael's on Saturday afternoon. Uhm, the kids were not excited. But I did get a Slice Hands-Free Mat at 50% off. So I was excited. 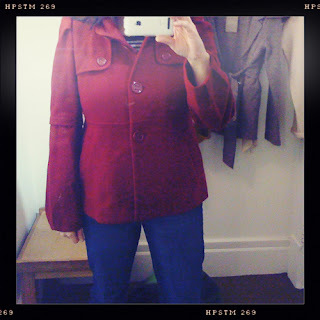 Anthro: coat too big, kids too cranky. I had to get out of there quick, or defenestration might have occurred. If there had been a window. Next day: more food. Malaysian food in Chinatown. 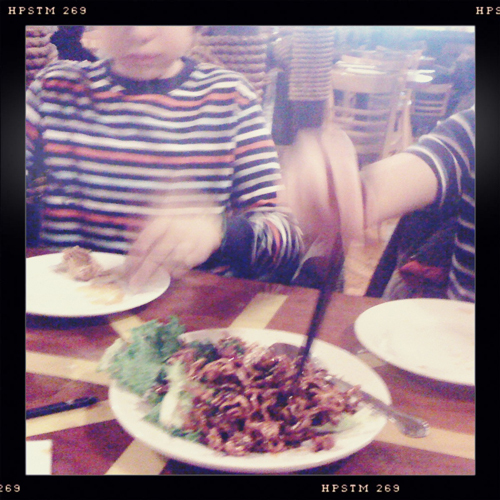 Yes, my kids do know how to use chopsticks. 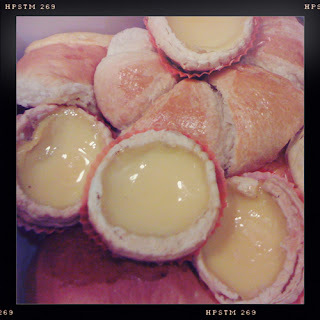 What kind of Taiwanese mother do you take me for? We had to forgo walking around town looking at sculptures because of the cold. We settled for some Chinese pastries instead. Not as educational, but so much tastier. Yes, more eating/drinking. This time at Barnes & Noble for some hot chocolate and mags. 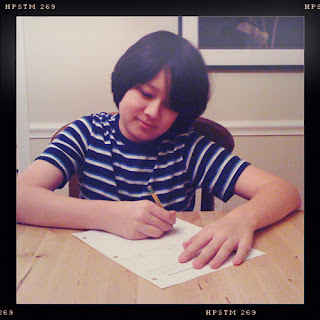 And finally home, where my oldest decided to reveal that he indeed had some homework due early Monday. But decided to wait til late Sunday to tackle it. Nice. Note the sheepish look on his face. And that, my friends, was my exciting weekend. Go us! I'll be back tomorrow with two winners. Go you! If you came by for the giveaway, you'll find it here. Hi hi hi! Thank you all so much for the well wishes. I can use all the help to get the house sold. And thank you on the love re: CK Dream Team. It's really an honor! A few of you had questions about my move, and I thought I'd answer them here, since Blogger doesn't not allow me to email you directly. Where: 2,720 miles away. Los Angeles. We've lived there before, so it's not entirely foreign. But it's been a while. 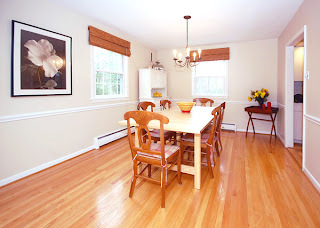 Stagers: I hired a stager recommended by my realtor. She came and basically told me what I already knew: pack up a lot of our belongings, put them in storage. Then a few days later, she came back with two movers, and they rearranged all my furniture, lamps, pictures, etc. The guys would move a sofa, and the stager would go, "Can you move that an inch and a half to the left?" Totally what I'd do, if I had someone else doing the heavy lifting. I may have found my next job. As a stager. Not a mover. What else we did: painted all the red away (boo hoo), refinished the bathroom walls and tub (a guy came and sprayed the 60s out of them, it's all white and so beautiful now), put in new medicine cabinets, organized every closet in the house (thank goodness old houses have small closets), cleaned every nook and cranny, Magic Erased the remaining walls within an inch of their lives (note to self: buy stock in whatever company makes those), and the evilest thing of all: made the kids pack 99% of their Legos away. Remember that photo of my dining room being painted? Not my thing, but hey, if it will sell the house... And yes, Marie, you can quote me on your crusade against stainless steel appliances.